Seeing Yellow Jacket Nests On The Ground outside your home? Call Barnes Wildlife Control’s Yellow Jacket Removal Service Today! Avoid yellow jackets as they produce a vicious sting. They are an aggressive wasp that will attack in numbers. Barnes Wildlife Control’s Yellow Jacket Removal Service wants you to know that yellow jackets are a predatory insect in the wasp category. Ohio residents may encounter several types of yellow jacket including the eastern yellowjacket, bald-faced hornet, and more. Also, the German yellow jacket first appeared in Ohio in 1975 and now the dominant species in the state; the other species are natives. Yellow Jackets serve an important purpose as predators to many pesky insects. They are, however, a potential threat to you and your family as well. If you’ve been stung more than ten times, or got stung in the mouth or around the eyes, by all means, you should seek medical attention. Also, if you have had an allergic reaction to a yellowjacket sting in the past, or if you experience difficulty breathing or swallowing, confusion or slurred speech, tightness in the throat and neck, or weakness leading to fainting, you should immediately seek medical attention at an emergency facility. 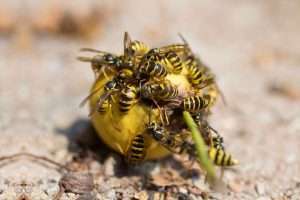 So, please avoid any serious problems with yellow jacket stings and contact Barnes Wildlife Control’s Yellow Jacket Removal Service, THE Go-To Company for those nasty yellow jacket problems in the Greater Dayton Ohio Area. For our expert, long-term yellow jacket removal service in Greater Dayton Ohio, Call Barnes Wildlife Control At (937) 340-1867 Today. All wasps will defend their nests, but Yellow Jackets are the most aggressive. If a colony is disturbed, yellow jackets get very aggressive, and they create a painful sting. Yellow Jacket workers measure about a half inch on average while the queen is slightly larger. Despite their aggressive behavior towards humans, yellow jackets are actually good to have around. Specifically, they help control the populations of many annoying insects during the summer months. Finally, yellow Jackets are capable of stinging several times and are known to have a relatively painful sting. Therefore, Barnes Wildlife Control’s Yellow Jacket Removal Service suggests you avoid contact with a yellow jacket nest whenever possible. Watch Out! Sugary, Carb-Loaded Foods Like Fruits, Nectar, and Saps Attract Yellow Jackets! Yellow Jackets love sweets. If you have an apple tree in your yard they will search out rotten sweet apples on the ground. The typical yellow jacket diet consists primarily of sugary, carb-loaded foods like fruits, nectar, and saps. Also, their larvae feed on proteins from insects, fish, and meat. Furthermore, a yellow jacket colony can number in the thousands, with the nests reaching well over a foot in diameter. Nests are started by a queen during warmer months and build until they eventually die off in the winter. For your safety, do not threaten a yellow jacket or its nest as they will defend their territory ferverously. If you notice a yellow jacket nest on or near your property then call our qualified professionals at Barnes Wildlife Control’s Yellow Jacket Removal Service for expert yellow jacket removal! Yellow Jackets In and Around The Home – Barnes Wildlife Control’s Yellow Jacket Removal Service Says Be Careful! 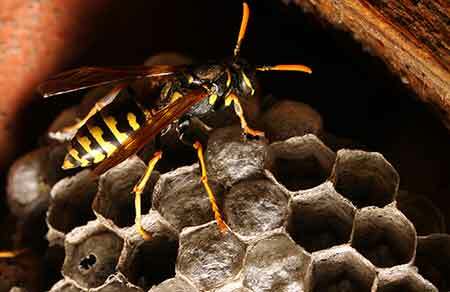 Be careful of yellow jacket nests hanging from areas of your home. 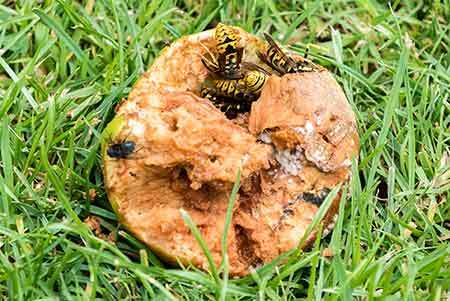 You want a professional like Barnes Wildlife Control’s Yellow Jacket Removal Service to deal with this issue. Yellow Jackets usually don’t cause structural damage to people’s homes. They will, however, build nests on or inside your home if they find it a suitable location. In addition, a yellow jacket nest directly on or inside your home has obvious implications. For example, there is massive potential for yellow jackets to invade your living space, which can make your home almost uninhabitable. If yellow jackets are congregating on or around your home then your main priority is to remove them as quickly as possible. Also, they are extremely dangerous if confronted at their hive, so please don’t try to attack them with clubs, guns, hoses, or anything threatening. If yellow jackets are on or near your property then call the trained professionals at Barnes Wildlife Control’s Yellow Jacket Removal Service of Greater Dayton Ohio for safe, effective yellow jacket removal. For your safety, do not threaten a yellow jacket or its nest as they will defend their territory ferverously. If you notice a yellow jacket nest on or near your property, call our qualified professionals at Barnes Wildlife Control’s Yellow Jacket Removal Service for expert yellow jacket removal! Yellow Jackets usually don’t cause structural damage to people’s homes. They will, however, build nests on or inside your home if they find it a suitable location. 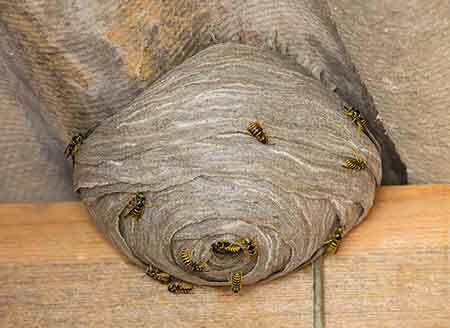 A yellow jacket nest directly on or inside your home has obvious implications. There is massive potential for yellow jackets to invade your living space, which can make your home almost uninhabitable. If yellow jackets are congregating on or around your home, your main priority is to remove them as quickly as possible. They are extremely dangerous if confronted at their hive, so please don’t try to attack them with clubs, guns, hoses, or anything threatening. If yellow jackets are on or near your property, call the trained professionals at Barnes Wildlife Control’s Yellow Jacket Removal Service of Greater Dayton Ohio for safe, effective yellow jacket removal. Barnes Wildlife Control’s Greater Dayton Ohio Yellow Jacket Removal Services Control’s Other Insects As Well! Are there are other annoying pest bugs crawling and flying around other than yellow jackets? If so, then Barnes Wildlife Control’s Greater Dayton Ohio Insect Removal Services deal with all types of creepy crawling or flying pest bugs. So what bug pests do we control? Barnes Wildlife Control Treats You Like Family – We Care About Protecting Our Clients! Watch Out For Yellow Jackets Stings – They Hurt And Can Be Dangerous! Yellow Jackets are notorious for their stings. They have small barbs on the end of their stingers which allow them to retract and sting several times. Some people may have severe allergic reactions to yellow jacket stings to the point of being life-threatening. So, if you have any yellow jacket (or bee) allergies, please avoid yellow jacket nests at all costs. An expert yellow jacket removal service such as Barnes Wildlife Control’s Yellow Jacket Removal Service is the smart option for safe, effective yellow jacket nest removal. Each yellow jacket removal job starts with a survey performed by one of our courteous, professional staff members. Also upon arrival, they will perform a full property inspection to find all possible entry points as well as any nesting and breeding sites. Once inspection is complete, we form a custom control plan to fit your individual needs. Also, your technician guides you through the removal process step-by-step. In fact, our access of top-of-the-line products and years of combined experience and education makes us the best choice for your yellow jacket removal needs. Barnes Wildlife Control’s Yellow Jacket Removal Service is the #1 yellow jacket and insect control company in Dayton and surrounding areas. Call (937) 340-1867 today for expert yellow jacket removal service! Yellow Jackets Coming Out Of The Ground Around Your Home? See Yellow Jacket Nests On Your Greater Dayton Ohio Property? Are Yellow Jackets Stinging You Or Your Pets? Yellow Jackets Infesting Your Yard? 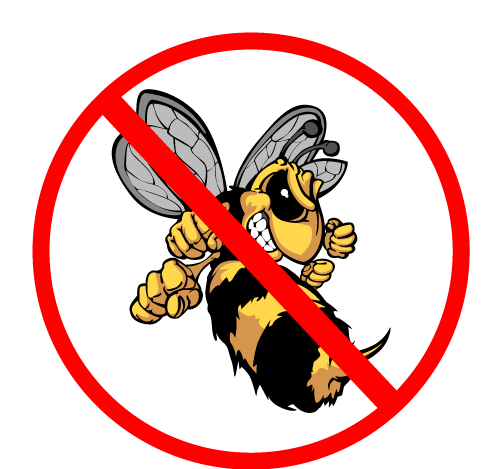 Contact Barnes Wildlife Control’s Yellow Jacket Removal Service Now!